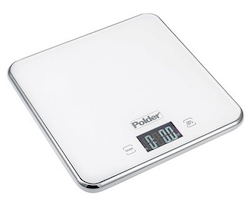 This Polder Slimmer Stainless Steel Digital Kitchen Scale features a large stainless steel work surface with a covered touch screen for easy cleaning. The back lit LCD display features large numbers for easy reading. Includes an Add & Weigh tare function with auto-shut off after three minutes of non-use. 11 lb. / 5 kg. capacity. Measures in high precision increments of 0.1g./0.01 oz. Dimensions: 7-3/4" x 7-3/4" x 1/2"